Clicking on the Create button in the Send Grid Integration panel at the top of the Actions Management page will take you to a form that lets you create a new, reusable email campaign based on one of the email templates in your SendGrid email account. 3) Clone an existing action to a new action. Handy if you are setting up multiple similar actions. The Message Content form lets you select the Send Grid email template that will be used by this campaign action. The E-mail Template drop down list will be automatically populated with the names of the email templates from your SendGrid account. You can also add dynamic content to your SendGrid Emails. Clicking the “Add Dynamic Field” button will add a new dynamic field, you can add multiple. Each dynamic field will need a placeholder that acts as the substitution text in your email template. e.g. You could create a missionSuccess ratio as a derived metric based on the missionCompleted and missionFailed event counts then use that dynamically in your message. Variant Property that lets you dynamically alter content for each variant group in a campaign. The Placeholder field is uses freeform text as the substitution key in your content, you should therefore ensure that the same text doesn’t appear naturally in your text or you will end up with additional unexpected substitutions. You may want to wrap your substitution in something that won’t appear naturally e.g. %maxLevel% , #lastMission# etc.. Please check that the characters you use are acceptable with any 3rd party content delivery channels. e.g. We know SendGrid doesn’t permit angled brackets to be used on a substitution, <lastMission> would not work on SendGrid. Give your email campaign a name, select the template you want to use and press the save button. Your action will now be available to use in Out of Game Campaigns. Create some email templates in SendGrid. Check you have the outOfGameSend and sendGridEmail email events added in your Event Manager. 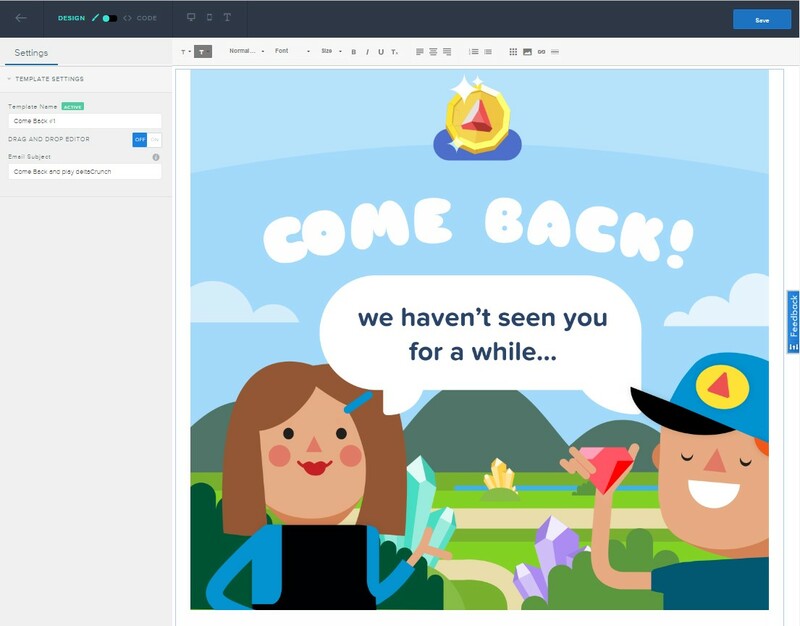 Email templates created in your SendGrid account can be connected to actions in deltaDNA and used in targeted campaigns. Navigate to the Templates > Transactional page in your Send Grid account and click the Create Template button. Create a new template group, this will become the name that appears in your delatDNA actions dropdown list. Then add a Version to your template. And start creating the template content. When you are happy with your template click the Save button. The new template will now show up in the email templates drop down list when you create a new SendGrid Email action.